Kristiansund is a beautiful, clean and open city that spreads out around the harbour and the four islands. The city has been built up only over the last 50 years, due to a devastating bombing during the Second World War when almost 900 houses burned down. The new city has developed its own style with bright, colourful houses. Note how the houses in the centre of Kirkelandet are side-gabled, just like the clipfish wharves were and are still being built. 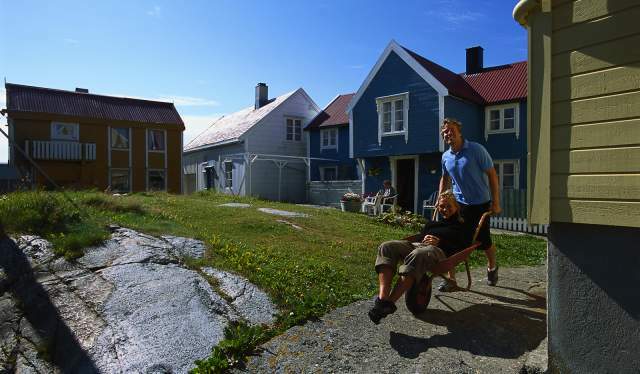 To get a feeling of the city's old, distinctive character, a visit to the old town of Innlandet is recommended. When you visit Kristiansund, you will soon realize that you are in a city of culture. Three things in particular are impossible to ignore: Opera, clipfish and the boat Sundbåten. Kristiansund is often referred to as the "opera town", and for a good reason. The city offers some 100 opera performances, an opera festival and the outdoor opera performance "Donna Bacalao" every year. There are also several other events worth mentioning, for example the Nordic Light International Festival of Photography, the Clipfish festival, the Tahiti festival, and the Kristiansund Church Art and Culture Festival, to name but a few highlights. Kristiansund is also Norway&apos;s clipfish capital. Any menu in the city&apos;s restaurants and cafes reveal that this tradition is still very much alive today. We recommend that you head to the snack bars that serve “fishan” – a local version of fish and chips and one of Kristiansund&apos;s specialties. Everyone who has been to Kristiansund has heard of the boat Sundbåten, one of the oldest public transportation vessels in the world that has been in continuous use. Sundbåten can take you on a round trip to the four Kristiansund "countries" in around 20 minutes. One of the most popular attractions in Kristiansund is located 14 kilometres north of the city. Until 1964, the village of Grip was the smallest municipality in Norway. Grip was an important fishing village already during the Middle Ages, and fishing remained the main livelihood until modern times. Today there are no permanent residents, but the old buildings have been preserved and are used as holiday homes. During the summer season there is a boat to Grip where you can join a guided tour of the island and visit the small red stave church. The church was built on the island&apos;s highest point around the year 1300. There are daily express buses from Trondheim, and further bus connections from Molde and Ålesund. You can also reach the main attractions in the area by bus. Hurtigruten stops at Kristiansund daily on its southbound and northbound voyage. There are also several daily express boats to Trondheim. Drive to Kristiansund on the E39 and Rv 70 from Bergen or Trondheim. We recommend that you driva via the Atlantic Road, which is one of Norway's National Tourist Roads. Kristiansund Airport Kvernberget is only 10 minutes by car from the centre of Kristiansund. There are daily departures to Oslo, Bergen and Trondheim. The boat Sundbåten connects the city's main islands Kirkelandet, Innlandet, Norselands and Gomalandet on a daily basis.